How many of you actually celebrate the independence of Mexico from French forces on May 5th? Yeah, I don't either. But I find it a very good reason to celebrate the Mexican-American culture through food and festivities (emphasis on the food). Since Cinco de Mayo is only days away (how is it almost May already?!? ), this Sunday dinner menu was easily inspired. Like many recent recipes that I have shared, I have lost count how many times I have had this on a Sunday dinner menu. So, it is time that the Avocado-Dressed Shrimp a la Mexican makes a solo debut. 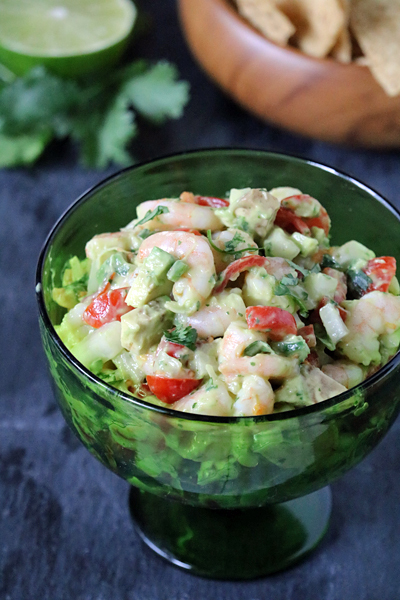 If you like pico de gallo, guacamole, and sweet shrimp, you are gonna love this! The original recipe used this mixture as a topping for tostadas, but I adapted it so it is a more scoopable appetizer/dish/salsa to begin our meals or have as a light snack. I added a bit of garlic for more flavor and also added an extra diced avocado for a nice balance of textures and because I love avocados. The recipe can be made a few hours in advance (bonus when you are a food blogger taking pictures on a Sunday before a big meal). Just make sure you press a sheet of plastic wrap directly on the surface of the mixture to avoid oxidation of the avocados. Bring to room temperature before serving, then grab some tortilla chips and dig in. In a large bowl, combine the shrimp, onion, tomato, garlic, and jalapeños. In the bowl of a food processor, add the lime juice, 1/4 cup of the cilantro and 1 avocado that has been pitted, skinned, and roughly chopped. Blend until smooth. Add additional lime juice if needed to thin to a "creamy dressing". Add kosher salt to taste, usually about 1 teaspoon. Mix the dressing into the shrimp mixture. Cover with plastic wrap directly placed on the surface of the shrimp mixture and refrigerate. Remove the mixture from the refrigerator about 30 minutes before serving. Just before serving pitt, skin, and dice the remaining avocado into small chunks. 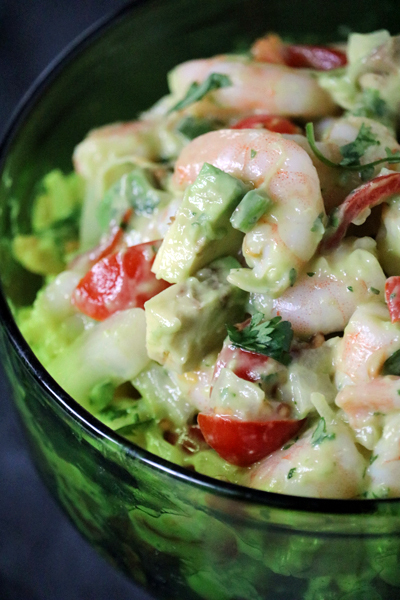 Stir the diced avocado and the remaining cilantro into the shrimp mixture. Season again to taste. Serve with tortilla chips or tostadas. Enjoy!